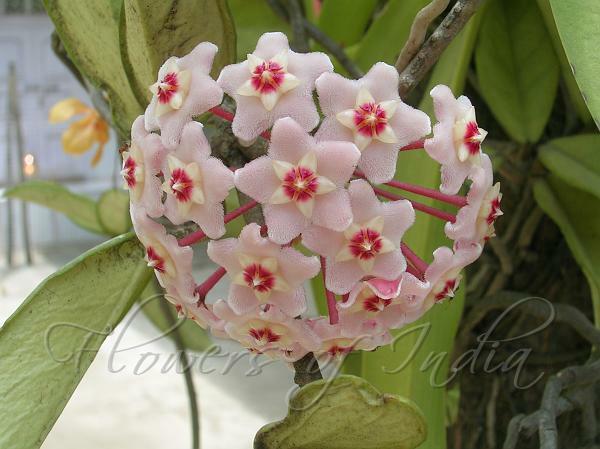 Wax flower is a slow-growing, woody, evergreen vine which has thick, fleshy, two to four-inch-long, green or variegated leaves, and produces in spring and summer large, round, hanging clusters of creamy white to light pink, 0.5-inch, fragrant flowers, each with a perfect five-pointed pink star in the center. Bloom fragrance is subtle and you must come close to the plant to enjoy it but it is well worth the effort. These long-lasting, showyblooms emerge on old flower spurs, which should never be pruned off. The delicate flowers appear to be made of porcelain and are truly unique. The flowers produce abundant nectar which drips down in warm weather. Because Wax Plant is especially sensitive to nematodes, plants are often grown in containers where the soil can be carefully controlled.